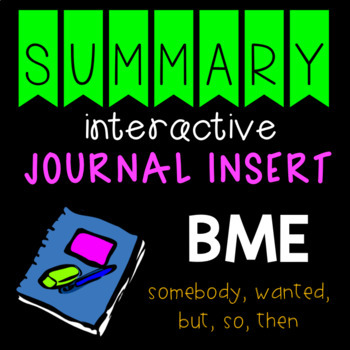 This summary insert is a wonderful addition to any Reading Interactive Journal for your students. The insert utilizes the "somebody, wanted, but, so, then" method for comprehensive summary writing. It comes with a flip flap insert, terminology cards to glue under the insert flaps, and an extra summary hand graphic for quick reference. It can be utilized for a broad variety of grades, and come in handy for both the students (reference) and teacher (reduce monotonous questions). My students love using their interactive journals, and found this summary insert to be particularly helpful (in Texas, the 3rd grade TEKS standards heavily emphasize the mastery of summarization) especially for reference purposes (which is the whole reason for an interactive journal)! It was fun, simple, and provided concise, yet helpful information to remind the kiddos about what we had discussed in class!